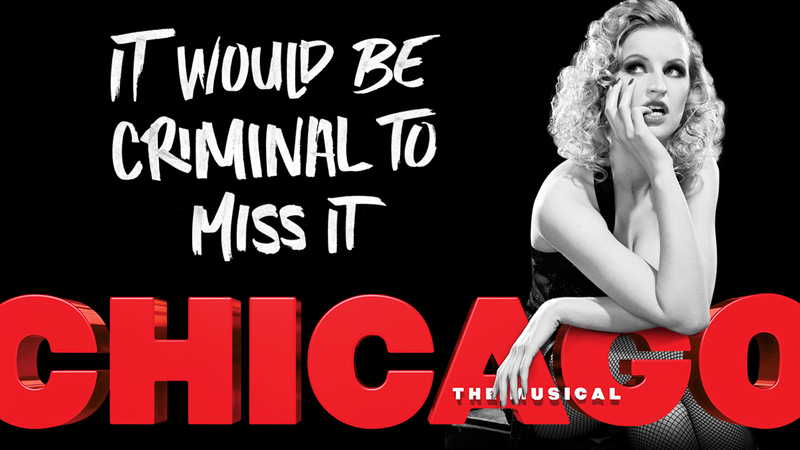 Purchase tickets to Chicago online, at the theatre box office, or by calling 212-239-6200. The Shuberts built the Ambassador Theatre in 1921, one of four theatres they constructed on 48th and 49th Streets as part of their post–World War I rapid expansion. None of the other three (the Ritz, now the Walter Kerr; the Forrest, now the Eugene O’Neill; and the 49th St, now demolished) are currently operated by the Shubert Organization. 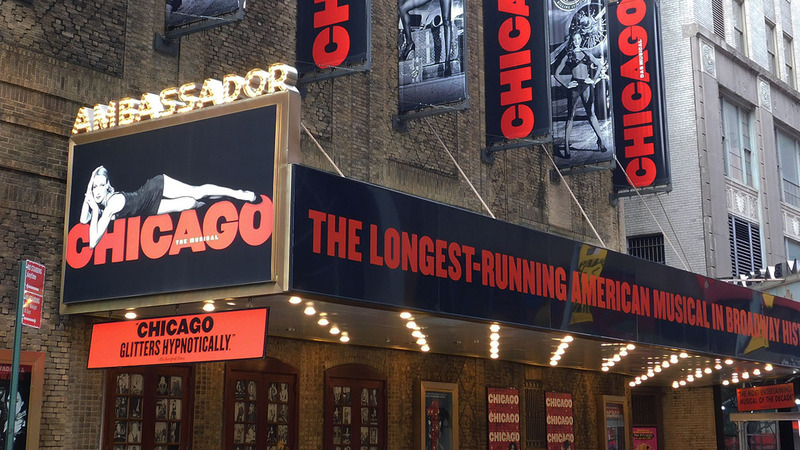 Chicago, the longest-running American musical on Broadway, is currently playing at the Ambassador Theatre. The Ambassador Theatre has 1,114 seats and is one of the Shubert Organization‘s 17 Broadway theatres. Chicago is recommended for ages 12 and older. Children under the age of 4 will not be permitted in the theatre. There is a wheelchair-accessible restroom. Accessible seating for this performance as indicated on the seating map. The theatre is not completely wheelchair accessible. There are two small steps into the theatre from the main entrance from the sidewalk. The side entrance has no steps from the sidewalk; please alert the Box Office upon arrival. Please be advised that where there are steps either into or within the theatre, we are unable to provide assistance. Mezzanine location: Two flights of stairs, up 38 steps. Please note, once on the Mezzanine level there are approximately two steps per row. Entrance to Front Mezzanine is behind row E. Entrance to Rear Mezzanine is in front of row A. Reservations are not necessary. A driver’s license or ID with printed address is required as a deposit. Please e-mail [email protected] or call: (212) 582-7678 to reserve in advance. The Ambassador Theatre provides at least 10 infrared assisted-listening devices for every performance at the theatre. Beginning four weeks after a show’s official opening-night performance, at least 10 audio description devices are available for every performance at the theatre. In addition, there is unlimited access to downloadable audio description software for personal mobile devices, available beginning four weeks after a show’s official opening-night performance, which provides an automated detailed account of the visual of the production, free of charge, for blind or partially sighted patrons. The theatre also offers handheld devices and software that provide captioning for deaf or hard-of-hearing patrons, available beginning four weeks after a show’s official opening-night performance. Additional devices can be available with at least 24 hours’ notice by contacting Shubert Audience Services at 212-944-3700 or [email protected]. There is also a representative at the Shubert Audience Services kiosk at every performance to assist any patron with the audio description devices, software, or captioning devices. A Shubert theatre since it was built in 1921, the Ambassador has housed the revival of John Kander and Fred Ebb’s Chicago since January 29, 2003. Before the longest-running revival in Broadway history moved in, the Ambassador was home to Topdog/Underdog; Kate Burton in Hedda Gabler; A Class Act; The Ride Down Mt. Morgan; It Ain’t Nothing but the Blues; You’re a Good Man, Charlie Brown; Bring in ’da Noise, Bring in ’da Funk; and Fool Moon. Prior to that, the Ambassador was home to Buttons on Broadway; Glynis Johns, Rex Harrison (in his final Broadway appearance), and Stewart Granger in The Circle; revivals of Dreamgirls and Ain’t Misbehavin’ as well as Oba Oba, the Brazilian revue; Leader of the Pack; and Barbara Cook: A Concert for the Theatre. Other 1980s productions included Bob Fosse’s megahit Dancin’, which moved here from another theatre, and Your Arms Too Short to Box With God. The 1970s brought a revival of Sandy Wilson’s The Boy Friend with Sandy Duncan and Judy Carne; Paul Sills’s Story Theatre, which presented children’s classics; Melvin Van Peebles’s Ain’t Supposed to Die a Natural Death; Jim Dale in a lively revival of Scapino; a revival of Stephen Schwartz’s long-running Godspell; Estelle Parsons in a solo tour de force Miss Margarida’s Way; and the Eubie Blake revue Eubie!. The 1960s brought Paddy Chayefsky’s The Tenth Man from the Booth Theatre; Gladys Cooper in an adaptation of E. M. Forster’s A Passage to India; Joseph Cotten, Patricia Medina, Russell Collins, and John Beal in Calculated Risk; Stop the World — I Want to Get Off from the Shubert Theatre; Ira Wallach’s comic Absence of a Cello; appearances by the Paul Taylor Dance Company and Charles Aznavour; Robert Preston and Rosemary Harris in The Lion in Winter; Robert Anderson’s amusing collection of four playlets called You Know I Can’t Hear You When the Water’s Running with Martin Balsam (Tony Award), Eileen Heckart, and George Grizzard; and We Bombed in New Haven starring Jason Robards Jr.
From 1944 to 1956 this theatre was leased to radio and television networks, reopening in 1956 with David Wayne and Arthur Kennedy in The Loud Red Patrick. This was followed by Tallulah Bankhead in Eugenia, adapted from Henry James’s The Europeans. Some 1930s gems: Spencer Tracy in the prison drama The Last Mile, which lured him to Hollywood; Ayn Rand’s courtroom drama Night of January 16, starring Doris Nolan and Walter Pidgeon; the Abbey Theatre Players from Dublin in a series of plays; and Danny Kaye making his Broadway debut in The Straw Hat Revue with Imogene Coca, Alfred Drake, and Jerome Robbins.